Based on reviews from 2 experts and 17 users. Learn how our rankings work or see our guide to Nike Hypervenom football boots. Updated Apr 2019. Power, agility, and traction are the primary concepts that inspired the production of Nike Hypervenom Phantom football boots. Characterized with a “Deadly Finishing” tagline, the Hypervenom collection is a lineup of boots that are built for unrivalled goals. The silo collection is equipped with modern technologies that are meant to enhance ball touch and shot velocity. True to its name, the Hypervenom football boots are constructed to attain hyper yet fatal victories by targeting strike zones and soleplate responsiveness. Nike’s innovation team aimed to produce non-traditional elements that can provide new solutions to typical boot issues. It was their goal when they conceptualized the Nike Hypervenom football boots. From firm ground football boots to turf boots, the Hypervenom technologies are fit for the attacking goalscorer. Whether you are an amateur or professional player, it is always best to know the noteworthy features of your potential boots. 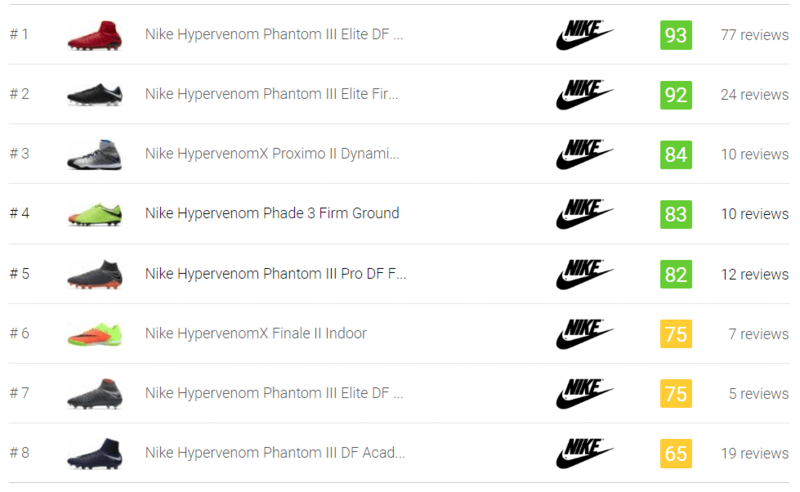 Below is a list of the Hypervenom collection features and their functions. The Hyperreactive Plate has been fondly known to be the hybrid of the Magista and Mercurial soleplate. It is due to the combination of conical and chevron studs in the plate, with additional braking studs in the forefoot. The plate’s forefoot flexibility and overall durability are made possible with the combination of Pebax and Nylon materials. The hexagonal-conical studs are positioned on the medial side for rotational maneuverability. Its hexagonal form aids in smooth exiting cuts. On the lateral side, the Chevron studs line up for aggressive traction and quick changes of direction. These are the same Chevron studs seen in the Nike Mercurial boots. Two straight studs are positioned on the center of the forefoot to allow controlled acceleration when braking. It is also worth noting that the forefoot plate of the Nike Hypervenom football boots, in comparison to the other lineups, is more flexible and responsive. It is especially helpful for push-off motions. The soleplate is seen in some of the famous Nike Hypervenom football boots such as Phantom III Elite Firm Ground and Phantom III Elite DF SG-PRO. The dimpled texture seen dominantly in the upper is the distinct ball-touch feature of the Nike Hypervenom football boots. The geometric pods that are neatly arranged in the upper are built to produce friction to the ball, making strike zones sensitive and more controlled when it comes to dribbling and switching for a deadly finishing. Internally the textured dots are stuffed only in the areas of usual ball contact while the rest remains hollow to maintain the weight of the boots. This unconventional boot component proves that Nike Hypervenom football boot features go beyond traditions to achieve new solutions. The raised surface is also seen in the upper of the Hypervenom PhantomX series. Flywire is the lockdown element for Nike Hypervenom football boots. It acts as overall support to the upper by wrapping the midfoot. It is installed in the lace holes to make the boot less restrictive as it is locked down from the sole. It was conceptualized by the director of Nike Innovation, Jay Meschter. The integration of the cables to the asymmetrical lacing provides a hugging sensation to the foot making it more secure in comparison to other regular lacing systems. The nylon cables are meant to reduce weight and increase the overall stability of the Nike Hypervenom football boots. Some of the Nike Hypervenom football boots with Flywire are the indoor variations such as the HypervenomX Finale II Indoor and the HypervenomX Proximo II DF Indoor. Another non-traditional feature that is integrated with the Nike Hypervenom football boots is the Asymmetrical lacing system. As what the name suggests, the laces are slightly positioned in the lateral side to give strike zones a more spacious area. In this way, fewer distractions can impede the motion of the ball allowing more player control. Most of the Nike Hypervenom football boots have asymmetrical lacing system including the Hypervenom Phantom III Academy DF Firm Ground and the HypervenomX Finale II Indoor. NikeSkin is a polyurethane layer coated with the upper material of some of the Nike Hypervenom football boots. It is a thin, translucent layer that was originally applied in some running shoes but was eventually featured across other sports. It serves as a protective element to the boot by keeping dirt and water from the cleats. With this technology, the boot stays intact against natural factors that can damage the shoe. The Hypervenom Phantom 3 DF Academy Firm Ground is one of the Nike Hypervenom football boots protected by this PU layer. 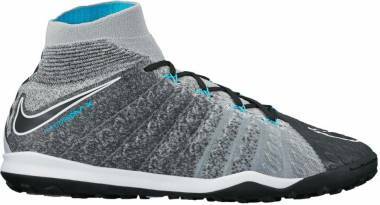 Zoom Air is Nike’s low-profile cushioning that is built for durability and stability. The lightweight feature is used in other sports shoes, not just in soccer boots. It is designed to lessen the force of unwanted impacts to the lower leg. Consequently, it protects the tendons and joints. Its responsiveness comes from the elastic fibers that are quickly bouncing back into shape inside a pressurized air unit. With this mechanism, the cushion brings the foot closer to the ground to enhance stability. The sock-liner is in the indoor and turf version of HypervenomX Finale. The Hypervenom football boot collection is a display of game-changing boots with unconventional yet impressive breakthroughs. It has several categories grouped by the technology compositions. The table below shows the groups within the collection, some boot examples, and their corresponding features. It is important to note that the feature section reflects the most common technologies in the category and are not necessarily present in all of the boots. When choosing for the best Hypervenom firm ground cleats for yourself, an array of choices would make decision-making more challenging. As a player, it is always wise to look for the Nike Hypervenom football boot that matches your preference and your budget. The information below serves as your guide in determining which among the three would pass your football boot standards. It shows the comparison between the high-end and low-end firm ground silo of the Nike Hypervenom football boots in terms of its advantages and disadvantages. Why should you choose the Nike Hypervenom football boots? Here are the three reasons why the Nike Hypervenom football boot is the best choice for you. Nike Hypervenom Football boots are known for having a balance of features. It is perceived as a mixture of Magista and Mercurial. It is evident with the boot soleplate which is composed of conical studs seen in the Magista series and a familiar Chevron stud from the Mercurial line. Another feature that is common with the Mercurial and Hypervenom is the full Flyknit construction. Players can experience the same type of comfort and breathability that Mercurial offers but with an added lockdown element, the Flywire cables. The textured upper is also an apparent similarity between the Magista and Hypervenom series. Strike zones are engineered for the same purpose for both boots, only this time an extra layer of protection is added with the Hypervenom boots, the NikeSkin technology. Undoubtedly, the Hypervenom series is a hybrid of Nike’s best collections. It is constructed to strike that balance when it comes to comfort, ball touch, and agility. The Hypervenom series, just like any other Nike collection contains boots that are grouped for any level of budget. Money-wise, the selection of boots in the series is a showcase of value. Some boots within the collection are expensive but are worth purchasing because they are all made of premium materials and technology-loaded features such as the high-end boot, Hypervenom Phantom III Elite DF FG. Additionally, some Nike Hypervenom football boots are budget-friendly but are still a bang for the buck as they also go through the same scientific and biomechanical testing as the more expensive Phantom boots. These are the Phantom Academy and Phantom Pro boots. The only differences between the collections are the quality of the construction and the absence of some of the notable technologies. The construction of Nike Hypervenom football boots is inspired by the impressive skills of some of the famous and victorious soccer players in the world including Neymar Jr and Wayne Rooney. Nike presents it as a boot fitting for forwards but through its versatile features, even other playing positions would best suit this football boot. Elite players feedback, such Neymar Jr, was an influence on the formation of the Nike Hypervenom football boots. The designers of the boot aimed to create a new breed of boots that are meant for agility, power, and traction. Are the Nike Hypervenom football boots available in kids’ and women’s versions? Yes. Nike offers junior and women’s version of the Nike Hypervenom football boots. Traditionally, Nike boot versions for kids do not necessarily have the same premium quality as its regular version. On the contrary, one interesting fact to note is that the junior version of the Phantom III DF is identical to its regular version upper material. It surely is a bang for the buck for those who are planning to purchase the junior versions of the boot. 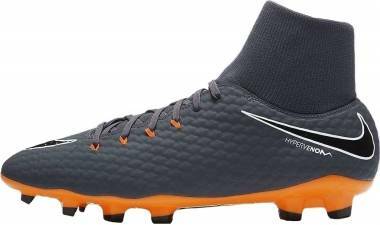 Are Nike Hypervenom football boots expensive? Nike Hypervenom football boots prices range from $55-$310 at their regular rates across all tiers. The Phantom boots are the most expensive and are priced at $250-$300. The most budget-friendly category is the Hypervenom Phantom III Academy which starts at $80-$90. The Phantom Pro boots are in between, ranging from $170-$200. What is the difference between Hypervenom Phantom III DF and its low top version? There are no significant differences between the two boots except for the Dynamic Fit Collar and their price difference. The Dynamic Fit (DF) serves as a sock-like extension to the boot, leaving a more tightened yet comfortable sensation. Choosing between the two is a matter of personal preference. If you personally like having a sock-extension, then the DF version is the best choice for you but if you want to go for a more traditional low-cut sensation, then you can go for the low-cut version. It is also important to know that choosing the DF boot would cost $50 more due to the added collar feature. What is the very first Nike Hypervenom football boot? The Hypervenom Phantom boot is the original silo from the collection headlined by the naturally talented Brazilian forward Neymar Jr. Neymar just recently signed his contract with FC Barcelona in 2013, when he introduced the boot in Rio de Janeiro. The cleats were debuted by the English forward, Wayne Rooney in black and orange colorway during the first match of the Confederation Cup on the same year. What are the limited or special edition Hypervenom football boots? The Nike X EA Sports Hypervenom III, Hypervenom GX, and Robert Lewandowski Hypervenom III are the special-edition boots from the Hypervenom line-up. Headlined by Mauro Icardi and Edinson Cavani, the Nike X EA Sports Hypervenom III is a collaborative boot of Nike and EA Sports, the online video game-maker. Only 3000 adult pairs and 1000 junior versions were made available since it was launched in September of 2017. Hypervenom GX is celebratory boot crafted to honor Nike’s first ever boot made in the Montebelluna facility, the Air GX. The boot is a hybrid of heritage and technology as its upper is a combination of Algeria leather and Flyknit. It is considered to be the lightweight edition of Air Gx, weighing 35% lighter than the original one. Nike customized a boot for the fearless Polish striker, Robert Lewandowski. The special edition boot was built in honor of his record-breaking achievements. The black and red Hypervenom II boot is designed with an eagle which represents his Polish identity. Can I customize the Nike Hypervenom football boots? As of today, only the Nike Tiempo and Mercurial boots can be customized through NikeID.